Southern California (all California even) spews and spawns skateboard and surf culture as if the constant sunshine keeps society from coagulating boys and girls into traditional sports like a hereditary hemophilia disorder. With skateboard culture comes the unique artwork that splashes T-shirts, adorns the bottom of skate decks, and fills the pages of magazines. Inspired and pulling from this plethora of creativity throughout the decades, local artists in Echo Park put together a gallery show of personalized skates, iconic collages and classic memorabilia. 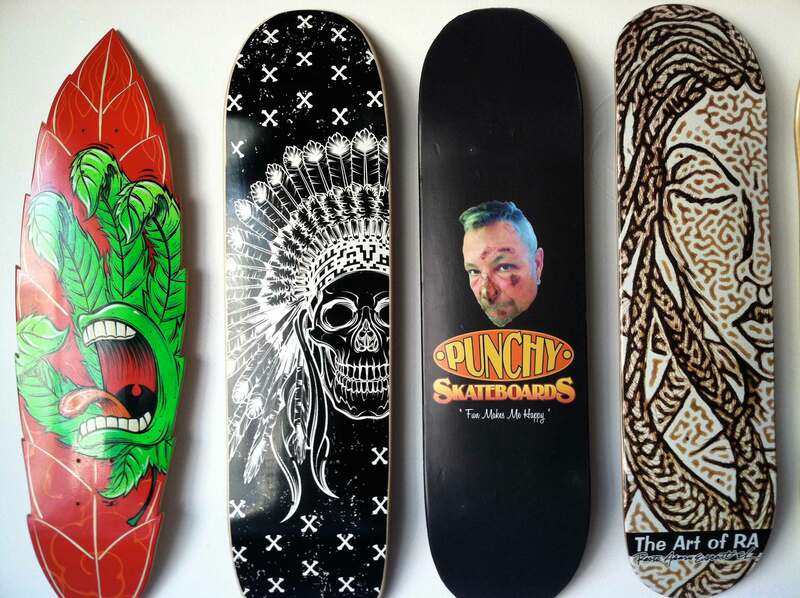 The majority of the show consists of a variety of art styles hand painted or printed on the bottom of skateboard decks, from classic movies star images to the 70s-esque retro design of clean colorful lines against a background colorfield. This ‘bottom-deck’ (not to be mistaken for ‘low-brow’) creativity extended into an ambitious 3-D installation of a deck spinning from a chord attached to the roof, painted with a glossy enamel in glowing black-light colors (ultraviolet light included), showing the famous Natas SMA pentagram repeated from top-to-bottom, and includes 3-D glasses for added audience participation. 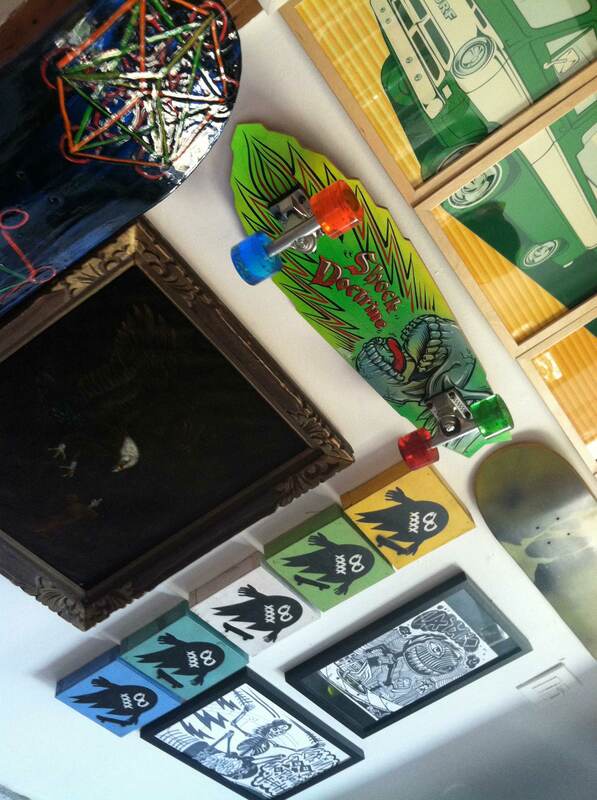 In another area of the gallery the back wall is dedicated strictly to skateboard history. From an old helmet to a great collection of vintage magazines and letters the viewer takes a trip down memory lane while paying homage to the legends who innovated the sport. Last a small but favorite part of the gallery show includes traditional canvas and collage paintings that juxtaposes the art of skating with recognizable images that normally don’t mix. A Pac-Man ghost jumping on a deck, or an African native rolling through the Sahara on a board? 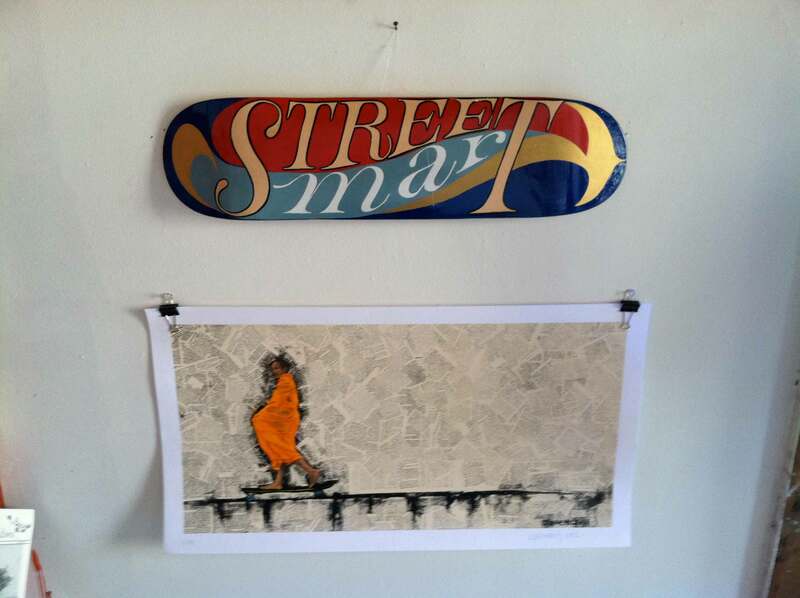 Both these particular pieces of art you easily imagine on a modern skateboard, and might see someday in the future. This entry was posted in Art, culture, Echo Park, L.A., LA, Los Angeles, Skate / Surf and tagged art, art gallery opening, artwork, Bureau of Art and Culture, collage, culture, Echo Park, hand-painted skateboards, June, L.A. the Blog, Los Angeles the Blog, Pac-Man ghost, painting, skateboard culture, Skaters Rule, surf. Bookmark the permalink.